Boiler Water Treatment Chemicals Market – Global Industry Analysis and Forecast (2017-2026) _ by Type, by End-Use Industry and by Geography. Home » Reports » Material & Chemical » Boiler Water Treatment Chemicals Market – Global Industry Analysis and Forecast (2017-2026) _ by Type, by End-Use Industry and by Geography. Global Boiler Water Treatment Chemicals Market was valued at USD 2.5 Billion in 2016 and is anticipated to reach USD 6.05 Billion by 2026, at a CAGR of 10.1%. Increasing requirement of steam and pure water from numerous end use industry is expected to rise the boiler water treatment market during the forecast period. Boiler water treatment involve three main factors namely corrosion protection, continuous exchange of heat and high quality steam production. 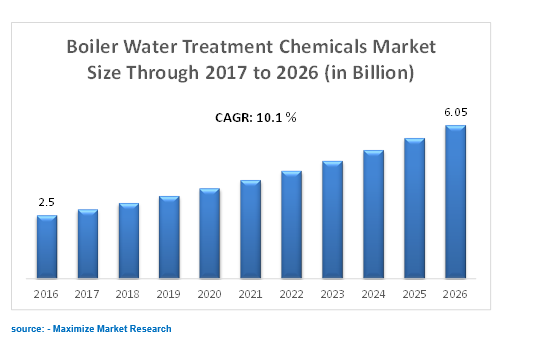 Growing industrialization across different economies are certain key drivers to further boost market demand globally for boiler water chemicals. Corrosion inhibitors segment of boiler water treatment chemicals market holds the largest market. Scale inhibitor is about to show a steady demand while oxygen scavengers will gain a moderate growth. Considering the end-use industry segment, power will lead market for boiler water chemicals. Increasing demand for power in emerging economies along with its continuous growth are certain key drivers that will elevate power industry segment to maintain its dominance. Asia Pacific  region will form the largest market for boiler treatment chemicals market that can be attributed due to growing demand of power from growing economies like India and China. Refinish Paint Market for Automotive – Global Industry Analysis and Forecast (2017-2026) _ by Layer, by Resin, by Technology, by Vehicle, and by Geography.